I cannot emphasize it enough, this product was the sole reason I was able to sleep well when my Son was a baby. I decided to create a guide and identify the best baby movement monitor because I really want every parent to recognize the benefits of them! Reading The Dangers Of SUIDS Stopped Me Sleeping! Are There Any Drawbacks When Using A Baby Movement Sensor? The worst case scenario is exactly what I prepare for! What if the baby is sick in the night and isn’t able to turn their head away? What if you do not hear it through the monitor? Damn, it has me sweating just thinking about it! Let us also remember SUIDS (Sudden Unexpected Infant Death Syndrome), which is a very grim topic! This is the term used to describe the unexpected death of a child less than 1-year-old. It is one of the very worst situations you can find yourself in as a parent, without a doubt. These deaths happen in and around the sleeping area of a baby. If you are like me, you will read all you can about the dangers of SUIDS and what you can do to reduce the chances of it happening. The annoying fact is, after I read about the dangers, I found it difficult to sleep. On the lead up to the birth of my Son, I searched the internet for the best baby movement monitor, because I WANTED TO SLEEP. Sleep is a luxury when they are first born, make it easier on yourself by getting some good quality sleep….when you can! Knowing that I would be woken up if there were any issues with his breathing was extremely reassuring! The result was some good quality sleep – sometimes for well over an hour….bliss! I rated this Snuza Hero as the best baby movement monitor purely because it is a medically certified device and has far less false alarms than other options! The Snuza Hero is a small device that you attach to your babies diaper/nappy and senses breathing. After 15 seconds, it will give a little vibrate, which acts to stir the baby and minimize false alarms. If after 20 seconds, it still does not pick up any movement, the alarm will sound and you will jump out of bed and burst into their room like the Special Forces! Another reason I love this is the portability options. Obviously, it is no good for use in cars, or when you are taking them out for a walk but if you are stationary, it can be used as a movement monitor. As soon as you have a new baby, everyone you know will want to see it. When you pay your friends a visit and the baby is asleep, simply put the Snuza Hero on and you can relax! Although it looks pretty bulky, it is still comfortable and will not give your baby any problems. There are options out there with sensor pads, like the one below, and these are fantastic for your home but are not very portable….and they tend to give more false readings. 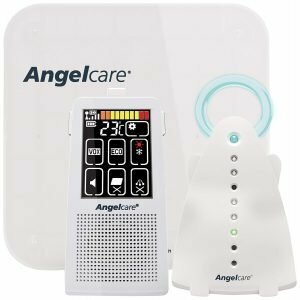 The Angelcare baby movement monitor is the exact model I used when my Son was a baby. At first, we had the ticking on – which gives an audible indicator of movement – but it annoyed Mrs. Dad Gold, so we switched that off and just had the LED indicator, she was cool with that. During the time we used this, we did have a few false alarms. The first had my heart beating through my chest and for some reason, my left eye hurt for hours afterward….it was likely to be a result of the rush of adrenaline! After the first couple of false alarms, I was much more cool about it, even taking a leisurely stroll in to make sure he was still breathing. Don’t get me wrong, there were not too many false alarms in the first 9 months….probably around 1 per month. As soon as he started rolling about in his cot, it was giving us false alarms more regularly. The Angelcare is an awesome solution though. They do have a more expensive baby monitor option that includes a video camera along with the sensor pad, but they are just a little bit too expensive for me! If you want a video option too, then feel free to check out the Angelcare movement monitor with video. The first few times they happen, your heart races, and you are likely to trip over things as you rush to the aid of your child. Then, after the first few, you take it a bit easier….but there is still an element of panic involved. Whilst the above is said in jest, it is really important to familiarise yourself with some basic infant resuscitation techniques, just in case you hear the alarm and it is not false. The Snuza Hero is the best baby movement monitor available. I will reiterate, just in case you missed the first 100 times! Having a movement monitor gave me so much reassurance when my Son was a newborn. I have no doubt that it was the sole reason that the little sleep I got, was actually good quality sleep. Sometimes getting your child to sleep can be challenging enough! So you need to enjoy the time you get when they do finally drop off! Sleeping is extremely important as a parent when you have work the next day (although, you are fully prepared for going back to work after your paternity leave), so anything that is going to help the quality is well worth me investing in it! I have many friends who have gone on to have kids since I spawned a child, and every single one of them has been told the reason why I used a movement monitor (Whether they like it or not). Around 50% of them took my advice on board and each one of those have come back to me and agreed! There are many parents who decide not to use one, mostly because they ‘can’t deal with the false alarms’. Personally, I would much rather deal with the false alarms if it meant I avoid what would be an utterly devastating discovery, should the worst happen. Anyway, I hope this has been useful to you. Good luck with whatever choice you make! If you have used one of the above options and have a different opinion, or you have had a good experience with another baby movement monitor, I would love to hear from you! Leave a comment below or get in touch!